The gorgeous Patong Beach, the most popular beach holiday destination in Phuket. Patong Beach is by far the most popular beach in Phuket and attracts hundreds and thousands of tourists a year. If you want a beautiful white sandy beach with a breathtaking backdrop of the Andaman Sea, then Patong Beach, Phuket is this and so much more. Patong Beach is the nightlife capital of Phuket and the world famous Bangla Road, or Soi Bangla in Thai, is wall to wall of bars, pubs, and nightclubs or all sorts of themes and music and colours. Patong Beach, Phuket attracts a host of different tourist all looking for something for Phuket’s most famous beach resort. Beach bums, clubbers, foodies, shoppers or anyone looking for a good time visit Patong Beach. The beach itself, although busy during the high season, December to April, still has golden sand and crystal clear waters, and due to its sheltered location makes it one of the best bays for watersports, snorkeling, and swimming. With its wide variety of activities and nightlife, Patong is an ideal place to party and play. By night the town has a bustling nightlife which includes literally hundreds of restaurants, beer bars, Go Go Bars, nightclubs, massage shops, cabarets, and tailors. Patong is around 30 minutes from Phuket airport, 10 minutes from Karon beach, and around 20 minutes from Phuket Town. There are hundreds for tuk-tuks that will take you anywhere in Phuket. If you are a foodie some of Phuket’s best restaurants are located in and around Patong and you can each and every type of food from anywhere around the world as well as at any budget. Restaurant highlights include the award-winning Baan Rim Pa and Joes Downstairs, both stunning restaurants overlooking Patong Bay, or the 9th Floor that has views from, the 9th Floor. 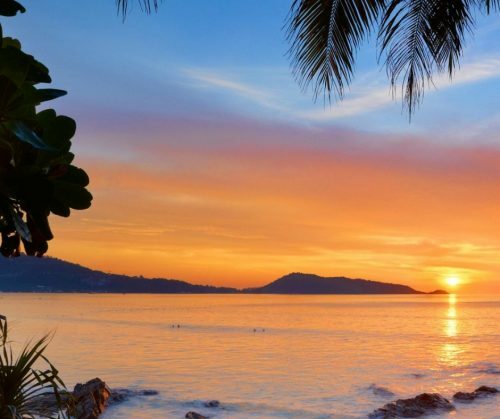 Overall Patong Beach, Phuket is an astonishing combination of breathtakingly beautiful white sand beach edged by the glittering Andaman Sea, and the most concentrated area of tourist accommodations, shops, nightclubs, restaurants, and attractions. If you want action, this is where you will find it.